It was hoped that the fossil of a tiny, feathered dinosaur which lived 124 million years ago in what is now China could reveal clues about the origins of bird flight. The creature, named Microraptor, closed the gap in the fossil record between large meat-eating dinosaurs and what at the time was thought to be the earliest bird, Archaeopteryx. 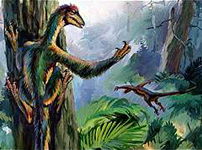 The crow-sized dinosaur did not fly but had clawed feet that it probably used to climb trees. The discovery added weight to the theory that small dinosaurs took to the branches to escape predators, gradually developing flight along the way. Other scientists were arguing that fast-running, bipedal dinosaurs evolved the wings, feathers, and muscle structure needed to take off from the ground. The Microraptor fossil came from a rock formation in western Liaoning, north-eastern China, a location which has yielded more than a thousand specimens of early birds and feathered dinosaurs. Xing Xu from the Institute of Vertebrate Palaeontology and Palaeoanthropology (IVPP) at the Chinese Academy of Sciences, Beijing, said a local farmer had collected the fossil. Xing Xu first saw it in a private collection - in the farmer's house. Then with the help of his farmer friend, the IVPP were able to acquire it. Scientific scrutiny revealed an adult creature about the size of a crow, with curved claws similar to those used by perching birds. Microraptor was classified as the smallest non-flying member of the theropods, two-legged meat-eaters that walked the planet between 230 million and 66.4 million years ago. The find further shortened the morphological gaps between dinosaurs and birds. It suggested that the paleoecology - the ecology of prehistoric organisms - for some bird-like dinosaurs was similar to that of early birds. The fossil was important because it could resolve a scientific debate about the origins of bird flight. Commenting on the report in the journal Nature, Dr Paul Barrett of the department of Zoology at the University of Oxford in the UK pointed out the fact that an amazing number of fossils had been found in the Liaoning region. Many of the new animals were helping to plug the gap in the records between birds and dinosaurs. The new find showed a number of modifications to the hips, tail, and teeth which were in some ways intermediate between those of advanced meat-eating dinosaurs and birds. There also appeared to have been feathers, adding more evidence to the view that feathers and feather-like structures predated the origin of birds. Finally, some of the anatomical specialisations of the feet hinted at a tree-dwelling habit - running contrary to what most scientists of the time estimated to have happened in the origin of birds. The consensus was that birds evolved from the 'ground-up', from fast running animals which gradually took to the air by becoming more efficient leapers. This paper suggested that there might be some currency in an older, less fashionable idea that birds are descended from tree dwellers which evolved flight though a number of intermediate gliding phases.